Successfully Added PDA Smartphone with Keyboard - Touchscreen Media Cell Phone to your Shopping Cart. Dual-band (900MHz, 1800MHz) PDA style easy use smartphone with full QWERTY keyboard. This touchscreen mobile phone is so good you will wonder how you ever survived without it. If you like typing text messages or reading email on the go, then you are going to love this cellphone! The phones keyboard is easy to use and navigation can be done with either the stylus or simple direction keys (up/down/right/left/enter) on the keyboard. Forget what you thought you knew about sending and receiving messages on a mobilephone because this one is just so easy and fun to use! This mobile phone is an active persons dream come true. The start page lists calls, messages, to-do tasks and other recent details to help you organize your life better. An easy to use media friendly phone with WAP, Bluetooth, TV, Dual SIM, crisp LCD screen, dual camera, JAVA games, FM radio, and a multitude of software productivity tools. For those people who have been holding off on getting a smart phone because they normally cost a small fortune or require an expensive long term contract, you are in for a wonderful surprise because this is being introduced to you at a wholesale Chinavasion price!. Chinavasion is the original direct from China wholesale electronics superstore, and we require no M.O.Q. (no minimum order quantity). Order today and we will ship it out via your favorite express carrier tomorrow. 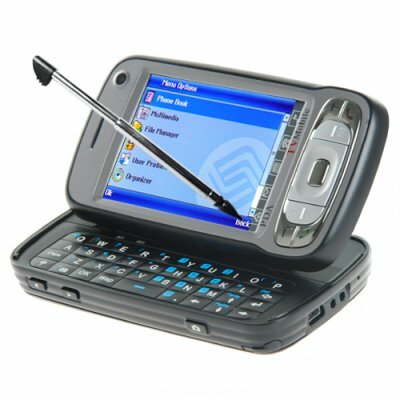 PDA style touchscreen cellphone with full QWERTY Keyboard. Easy to use phone with software productivity tools and dedicated function buttons. NOTE: This product is compatible with GSM at the two frequencies of 900MHz and 1800MHz. Please check with your local provider if you are unsure of your local band requirement.